“Good evening gentlemen, my name is Barrow”. And so begins one of the greatest personal clashes in cinema history. The verbal sparring between Alec Guinness’s popular party-loving Major, and John Mills’ by-the-book Lieutenant, is a joy to watch in what I think is one of the unsung classics of British cinema. In the aftermath of World War II, a Highland Regiment’s acting Colonel; Major Jock Sinclair (Alec Guinness) is furious to learn that he is to be replaced by Lt. Col. Basil Barrow (John Mills) an authoritarian who didn’t rise up from the ranks. Jock Sinclair soon begins a psychological crusade against the new Colonel, which can only end in tragedy for one or both of them. Although ‘Tunes of Glory’ can be seen mainly as a two-handler between cinema giants Alec Guinness and John Mills, the movie has a very strong supporting cast. Kay Walsh was good as Jock’s actress girlfriend, Gordon Jackson reliable as ever as a loyal adjutant, and a 19 year old Susannah York was memorable as Guinness’s mollycoddled daughter. In fact the whole cast is great and features many top notch British character actors at their best. I especially love Dennis Price’s Major Scott, who is the calming influence on the regiment, quietly observing while moving around in the background. The realistic wintry Highland setting was wonderfully recreated at Shepperton Studio’s in London by famed cinematographer Arthur Ibbetson. Talented director Ronald Neame went on to have two big hits; the critics favourite ‘The Prime of Miss Jean Brodie’ (’69), and the audience favourite ‘The Poseidon Adventure’ (’72). The meticulous Oscar-nominated screenplay was by the books author James Kennaway, who went on to script ‘The Battle of Britain’ (’69). There are a number of moments to cherish, but my choice is the scene where a twitching John Mills explodes during a drunken party. You can genuinely feel his rage and the shock reaction on Sinclair’s face says it all. Although I’ve never much cared for military-themed movies, ‘Tunes of Glory’ remains a superb character study of a class divide, and is an acting masterclass. 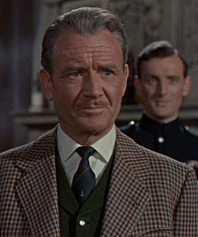 Both Alec Guinness and John Mills have never been better, though I have to give the most plaudits to Mills, who I think gave his best performance here, and one that I always love watching.